Unless you’re a day trader, you should not be trying to time the market. With the rise of smartphones and tablets, investors are constantly plugged into financial markets, but that doesn’t mean you should always be doing something with your portfolio. The average Joe is typically better off with a diversified portfolio built for the long term. Trying to time the market can be disastrous, especially when it comes to stocks and your retirement. As the chart below shows, $10,000 invested between January 3, 1995, and December 31, 2014, would have grown to $65,453 if it was constantly invested in the S&P 500. 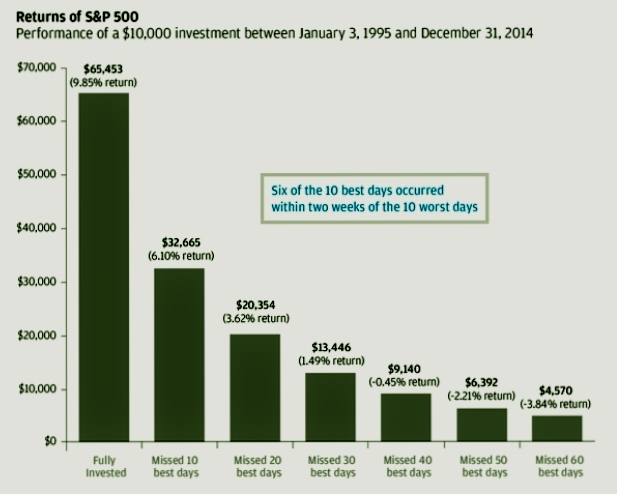 If you missed the 10 best days during that period, the investment would have grown to only $32,665, just less than half of the amount if you simply left the money untouched. Critics rightly point out that missing the worst days in the market is even better for a portfolio, but that is a dangerous strategy for most investors.